Dublin might be waiting to take on Kerry in Sunday’s All Ireland Football final but it was a Mayo man who was beaming brightly at Carton House yesterday as Royal Dublin ended their 47-year wait for victory the AIG Barton Shield. The men from the Dollymount links outclassed Galway, winning by 12 holes over the O’Meara Course at the Co Kildare venue with neither match getting past the 14th green. “Maybe we buried the curse today and proved that a manager from Mayo really can win an All Ireland,” joked team manager Mick Chambers, a Mayo native who has been living in Dublin for 25 years, as he walked away from his four-year stint with a trophy. Shaun Carter and Jeff Hopkins were three under par as they came back from one down after three holes against Joe Lyons and Stephen Brady, winning five holes in a row from the fourth to go four up and then the three more on the spin from the 11th to close out the match and Royal Dublin’s first Barton Shield since 1968. With Sligo man Barry Anderson and Cork’s Ian O'Rourke five up on Ronan Mullarney and Colm Hughes in the match behind, the Dublin side were 12 holes to the good with 11 remaining and champions at last. “We were quite disappointed last year when we came out on the wrong end of a really good, sporting semi-final against Warrenpoint last year,” Chambers said. “We sat down and we went back to it and reapplied ourselves and got into preparation for Leinster and this week. We have a fantastic panel that pushed them all the way and every player knew that if he eased up in his preparation over the last three weeks or month that he might not get his spot. "They played some savage golf and yesterday for 32 holes we had two dropped shots and today we were under par in both matches." 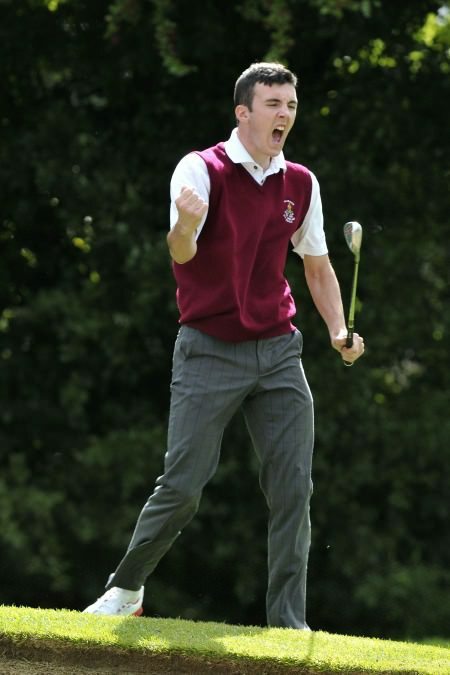 Galway’s Joe Lyons had no complaints about the defeat, adding: “Hats off to Royal Dublin, they totally outclassed us. We didn’t play well on the day and even if we had, I don’t think we would have beaten them either way. "We gave them momentum when we didn’t need to. We got out of the blocks okay but we lost the momentum and they were in a different class. Three under is good solid golf. In a singles you’d hope to shoot that yourself but we made it very easy for them." Corkman O’Rourke was delighted to get his first All Ireland win, adding: “We played really well today and it was nice it was convincing in the end. Anderson added: "To go into great club like Royal Dublin, it’s great. They make you feel such a part of the club. To be able to give something back is great for the members who have been there for so long, having heartache so many times, getting beaten by Portmarnock. It is nice for them. " While it was a team effort the key to Royal Dublin’s facile victory was their consistency and having made just two bogey in four foursomes matches over two days, they were almost unstoppable. “The two of us played well and had four birdies and one bogeys and over 12 holes that’s going to be tough to beat,” said former Boys international Hopkins, a 23-year old Skerries player who hopes to go to Q-School next year. "We played great and we have been playing great all week. "Even out practice we have been playing really well so we just had to go out there and keep hitting the shots we had been hitting all week. "We halved the first in birdie and had an unlucky break in the bunker and lost three. But we regrouped and fired back and won four or five in a row. All in all it was really good." A win at the par five fourth got them back to level and they then took the fifth with a Carter birdie from six feet and then took advantage of mistakes by Galway to win the sixth (missed green), seventh (bunkered) and eighth (three putts) to go four up. With the scores tied at 2-2., it came down to the clash between Westport’s David Scott and Greenisland’s John Armstrong, a 60 year old player drafted in only for the finals having not played in any of the qualifiers. He turned out to be the hero in the end, dribbling three foot putt into the hole for a half in bogey and a title winning one up win — the ball toppled in the front lip in slow motion, a la Tiger Woods’ chip in at the 2005 Masters — as Scott three-putted for the third time in a row. Armstrong levelled the match when Scott found water at the par five 15th. But he looked as though he would go one down at the par-three 16th when he duffed his tee shot into the River Rye but pitched to 10 feet from the drop zone and holed the putt for a half in bogey as Scott three-putted. Armstrong then lagged a speedy, 50 footer to the hole-side to secure his par five at the 17th after Scott’s similar effort slipped six feet past, leading to another three putt bogey. Suddenly one up playing the 18th, Armstrong bunkered his approach to the closing par-four but with Scott 50 feet above the hole in two, he splashed out to 15 feet and looked on as the Westport man three putted again, missing a five footer. Armstrong had nudged his 15 foot par putt some three feet above the hole and after what seemed like an eternity, it fell in the front of the hole for Greenisland’s first All Ireland pennant. “I played a reasonable bunker shot and then the nerves took a hold,” said Armstrong. “When I stood over that putt knowing what it meant to our little nine-hole club, I gave it too much. "When I left it above the hole — I didn’t see David missing that putt — I thought we’d be going up 19. This is ridiculous. “I could hardly hold the club and, I thought just touch it, just let the putter head take over. I can’t believe it. In the AIG Pierce Purcell Shield semi-finals, Munster champion Thurles proved too strong for Leinster champions Grange, running out 4-1 winners thanks to three wins and two halved matches. The Tipperary club will face Connacht champions Gort in the final after the Galway club beat Nuremore 4-1. Meanwhile, the Golfing Union of Ireland yesterday announced the appointment of Pat Finn as its first Chief Executive Officer. The appointment comes following an open recruitment process, and is one of the key pillars in the implementation of the Union's new Strategic Plan. The former General Secretary of the GUI, 39-year old Finn will now assume the new role, which will have overall responsibility for the implementation of the Strategy. Michael Hayes bt Fergus Rothwell 5/4. Barry Anderson & Ian O'Rourke bt Ronan Mullarney & Colm Hughes 5 holes. Dale O'Sullivan & Brendan Daly v Aidan Hawkins & Patrick McGurnaghan.